Lighthouse Cove is an actual place near my home town and where I have spent countless hours fishing the flats of the Texas Coastal Bay system for Redfish and Trout. The lighthouse was built in the 1850's marking the pass that La'Salle accidentally discovered a few hundred years earlier . It is constructed of steel and has stood the test of time as a sentinel or watchman over the Texas Coast for 165 years. I have always had a sense of awe fishing near this huge structure, and yet it seems so "lost." While the pass it marks is still there, no ships come and go any longer. The tides have made it too shallow, and now there is a pair of huge rock jetties down the beach a couple of miles that open the gulf up to the sea for modern ships. So, I chose to recreate this beacon of light in its glory days before the civil war, where the light keeper lived a lonely life many islands away from the mainland of Texas. I like the allegory this scene represents. Often, we must stand alone, feeling separate from the world, if we want to shine a light to those who are lost. I don't mean a light of moral living. This ultimately points to ourselves. No, I'm talking about the light of love that shines out and pours over those who are floundering and feeling a sense of loss or doom. No one is ever drawn to morality, but rather they are drawn to love. 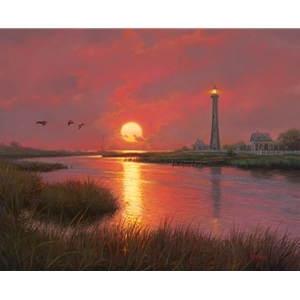 The warm light of this Texas sunrise and the Matagorda Island Light is a picture of your life. Let it shine.